An attractive walk encompassing some delightful canal towpaths, mostly flat through countryside and woodland near to the lovely villages of Long Itchington and Stockton. 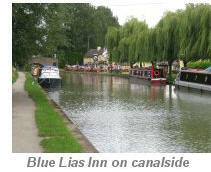 Refreshments are available at three canal side inns, The Blue Lias Inn ,The Two Boats Inn, and The Boat Inn. Also pubs in Long Itchington and Stockton. The walk incorporates sections of the Millennium Way, where you will be guided by the distinctive black Millennium Way way markers. Find out more about the walk by clicking on the information icon. Our walk starts from the The Blue Lias Inn situated by the canal on Stockton Road, between the villages of Long Itchington and Stockton. Emerging from the pub car park turn left along the road, cross the bridge over the canal and after a few steps you will reach a wooden gate on your left where you will see the first distinctive black Millennium Way way marker. Take gate to join the canal towpath and go with canal left. Stay on towpath passing under bridge 24, then pass the canal side Two Boats Inn and go under the A423 Banbury to Coventry road (bridge 25). 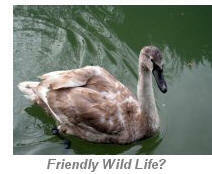 Immediately after passing under the bridge look out for a small brick built cubicle next to the towpath. Turn right off the towpath at this point, and immediately turn left past the cubicle to take a kissing gate into paddock. Cross paddock and take two further kissing gates on either side of a farm track. Go ahead over field to exit by kissing gate then ahead over next field towards a modern white house in the distance with a distinctive rear projection to find kissing gate. (Here we leave the Millennium Way to rejoin it later at point H). Take the kissing gate and turn sharp right down surfaced drive. Continue past houses to corner and follow yellow way marker through metal gate then stay right near hedge to cross bottom of garden of house maintaining the same line through a short area of woodland and continue through corner gap along a short path to exit by metal kissing gate to a cul-de-sac. Bear left to reach Shepherd Close and left again to reach Southam Road. Turn right on main road and after a few yards cross over using the pedestrian crossing and continue up road to the road junction where we bear left into Stockton Road. Ignore Collingham Lane on left and continue up Stockton Road passing a wooden bench on left. Stay ahead over Wulfstan Drive and soon we begin to leave the village of Long Itchington and head into the countryside. Continue past the Primary School on a footpath within a wide grassy verge then keep ahead on Stockton road walking along the footway within the wide grassy verge, past Spinney Fields housing complex. Shortly, you will pass a deep lay by on the right before reaching a sharp right hand bend. At the bend we leave the road to continue left down a gravel bridleway (hidden waymark on telegraph pole with sign to High Clays Farm). Where the gravel drive swings left to High Clays Farm, continue straight on down a wide grassy bridleway between trees and hedges. At the end of the track exit by gap next to large wooden gate and bear left to reach the canal towpath. Continue along towpath with canal right passing the flight of locks. Continue on past Top Lock Cottage. Pass Stockton Top Marina on right and then The Boat Inn also on the opposite side of the canal. Pass under bridge 21. After approximately 1/2 mile you will reach bridge 20. Go under bridge then almost immediately exit the towpath left to find road. Go left on road to cross over canal bridge and pass Station Farm on right walking gently up the road crossing another bridge over a disused railway line. After this bridge we descend gently along the road to reach a T-junction. Turn right at T-junction signed Stockton 3/4 mile then almost immediately take lane right to pass in front of the Countrywide Store. Pass a number of small business workshops on your left and stay ahead along the gravel track to go through way marked metal gate ahead. Stay along narrow track with tall metal fence on left. Continue along keeping metal fence left to eventually reach a concrete track. Go left here on the track keeping hedge left and after 75 paces or so take way marked footpath left in hedge gap by large tree. Go with well defined path with hedge and trees right in the direction of Stockton. Stay with hedge right to emerge to right of garages and continue forward past a brick garden wall to the road. Bear slightly right into Elm Row and continue along to reach the main road. Cross directly over into High Street and at the junction stay left down the road passing the Crown Inn on left. At the next junction turn right into Mount Pleasant walking gently uphill. (Here you have rejoined the Millennium Way). Ignore all side road and continue uphill to arrive at a grassy passageway, with houses left, leading through spinney to a field. On entering the field go left with hedge left to take a stile to the main road. Cross the main A426 road and take gap and then down steps to go with hedge left. Go through corner gap and along a short passageway continuing with hedge left along narrow track at field edge with fence right. Follow corridor over two wooden bridges then along woodland path staying close to wire fence on right. At the end of the wire fence you will come to a way post. Stay forward along the grassy path through the spinney, shortly to arrive at a gap. Go slightly right then immediately left, staying on the same line, (the waypost here is unseated and leaning against the hedge) to go with hedge left and after some 70 paces take gap left into woods to find redundant stile with waymark. Go around the redundant stile and ahead along delightful woodland path. Cross track and exit via metal kissing gate to a lake. Go right keeping lake left and take gap which leads back to your starting point at The Blue Lias Inn. 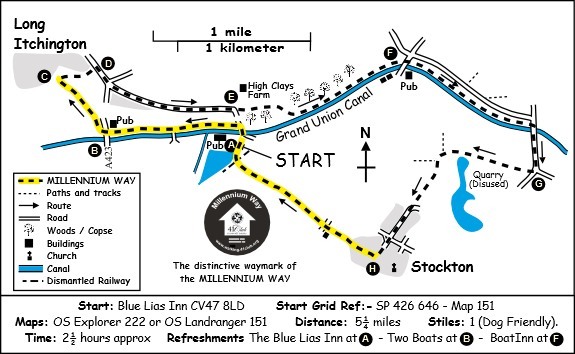 The walk start point is the ‘Blue Lias’ canalside pub, named after the extensive areas of blue lias clay, a raw material used in cement manufacture, surrounding the village of Stockton. 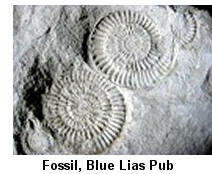 Blue lias is famous for its fossils, especially ammonites. The same material is found forming the cliffs at Lyme Regis in Dorset. The canal descends into the valley of the River Leam by the Stockton flight of ten locks (often known as 'the Itchington Ten'). Above the eighth lock down the flight, a short arm (now used as pleasure craft moorings) used to serve Southam cement works. (The rest of the flight will be climbed after the walk through Long Itchington). Until the arrival of the railways, the canal was a vital transport link for the local industry. Until the late ‘90’s the village was dominated by the now-closed cement works. This walk only skirts the edge of the village. Walk 26 goes through the centre and has more information on some of the historic buildings. 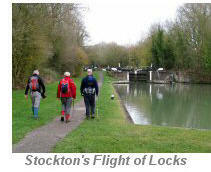 Returning to the canal, the Stockton flight is climbed, then the canal and a disused railway crossed. This was the Weedon branch, running parallel to the Grand Union and joining the Leamington Rugby railway line. This line opened in 1851 and closed to passenger traffic in 1959. The line remained open for freight serving the cement works until 1985. 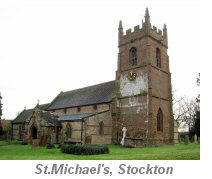 Stockton's name was first recorded in 1272, the name meaning 'a fenced enclosure'. Stockton developed as an industrial village in the 19th century. The chimney of the now-closed cement works can be seen for miles around. In 1898 a large fossil of an Ichthyosaurus was found locally and is now in the Natural History Museum in London. An image of an Ichthyosaurus is used on the sign at the entrance to the village. On the route back to the Blue Lias Inn, a waymarker is passed showing that this route is shared with the Blue Lias Ring Walks. 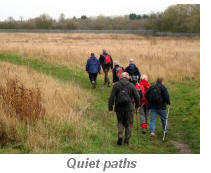 This is a group of 9 walks around the Stockton area, available as leaflets from Warwickshire County Council. The walk leaflets contain more historical information about the area and are illustrated by the late Henson Bamford, a local artist. All the paths, bridleways and roads we have used in these instructions are public rights of way as designated on Ordnance Survey maps. Following the instructions and walking tips on this web site in no way constitutes any liability on the National Association of ex Round Tablers Clubs (41 Club) that such routes or tips are safe or suitable. Copyright © 2019 Millennium Way. All Rights Reserved.